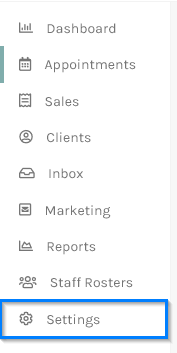 Click on the Settings menu on the left hand side. This will display the SMS Reminder Settings screen as shown below. To enable SMS reminders simply click the Allow SMS Automatic Reminders checkbox and to set the number of days the SMS text is sent before the appointment, select a value from the Days Before Appointment field. You can also forward all replies and confirmations to your mobile number, this is useful when you are on the road quite often and not logged in to your account. Simply tick the Forward text replies to my phone checkbox and enter your mobile number. 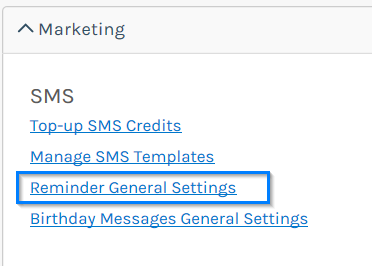 Next select the SMS Reminder Template in the Template field, this will prefill the Message field with a default SMS text, remember SMS texts are limited to 160 characters anything more you will be charged an extra credit. Merge fields are place holders for values that will be replaced when the message is sent. For example: ClientFirstname will be replaced with David and so on. To insert a template field, simply put your cursor in the message box where you want the field to appear and click on the merge field. Most importantly please enter the following sentence at the end of your SMS reminder message: Reply with this code [ConfirmationCode] to confirm. This will prompt your client to reply with a unique code to confirm their appointment. You can also preview your SMS message by typing in your number in the Test Mobile Number field and clicking Send Preview Reminder SMS. Click the Save button to save your SMS reminder message for the future. And that's it.. just sit back and You'reOnTime will automatically send out your SMS reminders so you can concentrate on growing your business rather than manually sending out your SMS reminders.